Ask our hygienists: How do I get my child to brush their teeth? As a parent I know that one single answer will not suit every family but I have found visual cues and leading by example often work best…oh and the odd rewards chart definitely helps too! When a child starts brushing and flossing their teeth at a young age, they’re more likely to continue these habits throughout their life. If they see mum or dad doing the same it reinforces this as normal everyday routine. 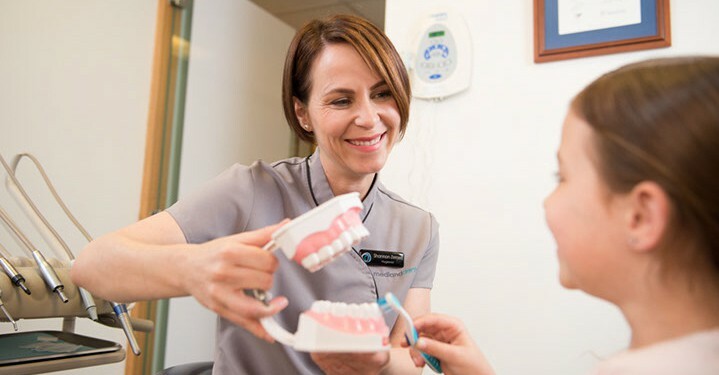 A large number of children need visual aids to help them understand a new concept, even something that appears mundane to adults like brushing and flossing their teeth. A tooth cleaning chart can help reinforce these habits early on, paving the way for a lifelong healthy smile. Medland Kids Club have created a colourful easy to follow guide that can help direct you and your child to brush and floss thoroughly. It comes laminated complete with suction cap for easy display in your bathroom. All Medland Kids Club members will receive one when they come in for their active maintenance appointments in 2016. 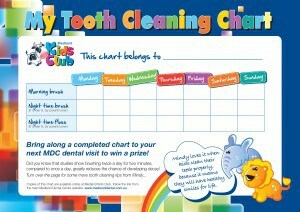 Medland Kids Club have also created an easy to use template to keep track of your child’s brushing and flossing. Allow your child to customise their charts by using stickers or coloured pens to decorate and mark the completed task.